The commentary that follows below was originally published at QNotes on Aug. 19. Per the instruction of publisher Jim Yarbrough, it was unpublished from QNotes’ website on Aug. 23. I have re-published it here. Though the commentary was clearly labeled as commentary and a personal reflection — adequately distinguishing it from news content — Yarbrough felt it was an inappropriate conflict of interest to publish the commentary given my role with Charlotte Pride, despite the newspaper’s overarching institutional conflict of interest. This conflict has previously been disclosed and is of general public knowledge, but for clarity: QNotes and its owner and staff have had a long institutional history of supporting and/or organizing local Pride activities for at least two decades. Yarbrough, along with David Moore, QNotes’ editor at the time, and others, were instrumental in relaunching and rebranding the city’s Pride festival in 2006. Yarbrough served as co-chair of that committee and in other roles, including sponsorship chair. The newspaper was also deeply involved as a sponsor, producing the event’s annual Pride Guide and selling water at the event. My involvement with local Pride activities and as a committee member working on media and marketing came in 2008 via the direct, personal invitation of Yarbrough, a few short months after I was hired at the newspaper. For most of the years since, I have remained involved as a board member or in some other volunteer role. I currently serve as a board member now. This note is published in an effort to be fully transparent — as it is highly uncommon for news organizations to unpublish content once it has been published. Yarbrough was given advance notice and acknowledged such notice that I would write a note publicly explaining why a decision was made to unpublish this piece of content on QNotes’ website. 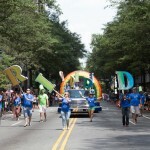 Photo Credit: Jennifer Hogan (HoganImaging.com), courtesy Charlotte Pride. Reprinted with permission. 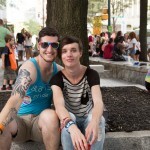 Charlotte Pride weekend came with a flurry of activity, quicker than I can ever imagine. It’s been that way ever since I first started volunteering with Charlotte Pride in 2008. The big event in August just sneaks up on you. It’s here before you realize it, you’re up before the sunrises on a summer Saturday morning and hours of set up go by in what seems like minutes and — boom — all of a sudden tens of thousands of people have taken to Tyron St. 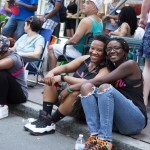 This year’s Charlotte Pride Festival and Parade was, simply put, the best ever. And I’m not saying that just because I’m on the board. All bias aside — it’s true and the data and feedback I’ve heard and seen back it up. Attendance jumped by 20 percent, with initial estimates coming in at 115,000-120,000 visitors over the weekend, besting last year’s record-setting year when the attendance broke the 100,000 mark. 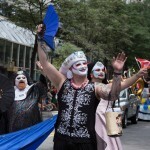 Nearly 3,000 individuals marched in the Bank of America Charlotte Pride Parade on Aug. 16, again up from last year. The crowds gathered for the parade seemed exponentially larger than last year. After the parade was over, they all flooded into the PNC Bank Festival Zone. There, two other presenting sponsors, Time Warner Cable and Wells Fargo, presented their own attractions — the VIP lounge and stage, respectively. More vendors were present this year, too, including all the favorites like PFLAG and HRC, MeckPAC, RAIN, Carolinas Care Partnership, LGBT Democrats, Equality NC, Primetimers and many, many more. For the first time, Charlotte Pride’s new Trans* Pride Committee set up their own festival booth, complete with two transgender flags flying atop their tent. On Sunday, they marched in the parade and one of their committee members, Macximus, performed on the Wells Fargo Stage. There were two things that made me extremely proud this weekend. Each year, I feel honored and special when I help plan our opening ceremony. It’s important. Symbolic. Carrying rich meaning. A time where we can say, “Yes, even at a gay Pride festival, we love our country, we honor our faith and we are members of this community.” This year, I was glad that the Rev. Dawn Flynn, the transgender pastor of New Life Metropolitan Community Church, was able to join with two other faith leaders — Temple Beth El’s Rabbi Jonathan Freirich and ReBirth Cathedral of Praise’s Bishop Ra’Shawn D. Flourney — in delivering an opening interfaith reflection. But before they began, Dawn led us all in a moment of reflection and remembrance for Elisha Walker, a missing Rowan County trans woman who was found dead just last week, and all our other trans siblings who have died much too early — all at the hands of transphobic or psychological violence. Second, I was really proud we were able to invite Ashley Williams from the local Black Lives Matter movement to address the crowd on the stage on Saturday. Ashley took to the platform at a prime time and the crowd loved her stirring, passionate speech. It’s things like these two instances on the stage that make Pride special, bringing us back to its roots as a protest and a riot — a demand for liberation and equality. I could go on and on about all the positives from this weekend’s event. But I just simply wouldn’t be able to do it justice. There are too many to thank, too much to recount. I will leave you with this short reflection: The hours of work, the literal blood, sweat and tears that go into making this event possible, by me and hundreds of other volunteers — all of it, every single bit of it, fills me with a smile and pride when I look out and see tens of thousands of my fellow LGBT community members having space for themselves openly and publicly, even if only for two days. It’s all y’all and the pride you show during the event and each and every day of your lives that makes all this worth it. I hope you had as much fun as I did seeing you all there.